There are violinists. And then there is Roby Lakatos. 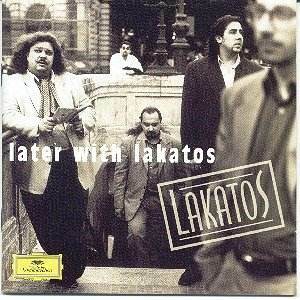 Reputedly discovered by Itzhak Perlman in a Paris bar, Lakatos has become something of a cult celebrity among the 'in' crowd. Courted by Menuhin, Grappelli, Anne-Sophie Mutter and Vadim Repin (to name a few) he has many more knocking on the door of his Brussels club. Last night, he played Ronnie Scott's for the first time and the wait was fully worth it. Playing two sets (and ending at 2.00am) his music is encrypted in a universal pastiche of many genres - Hungarian gypsy music, Moorish melodies, Italian opera, classical and jazz. The style is unashamedly flamboyant, but what amazes is his technique. Although he won first prize for violin at the Béla Bartók Conservatory in Budapest, one senses that his technique is beyond teaching. Almost everything he does would be anathema to more conservative violinists - there is, for example, the widest possible use of vibrato, and he rarely uses the bow to its full extent, but when he does the tone is rich and full. His use of spiccato and pizzicato is mind-blowing, and at times last night his violin was almost turned into a balalaika. The finger work is sensational - spot-on and using every inch of the neck. This is violin improvisation of the highest degree. His virtuosity is not singular. Ernest Bangó, on cimbalom and guitar, came a close second in terms of sheer brilliance. In the first piece they played, The Bird in the Dust, the cimbalom's sticks left welted marks in the air such was the velocity generated. Kálmán Cséki, on piano, perhaps has the clearest jazz style and his playing was peerless. Oszkár Németh (double-bass) and László Bóni (second violin) were more than an equal match. The strings swooped and soared wonderfully. In a fiery take-off of the Sabre Dance the combination of magnetic artistry and stunning virtuosity was breathtaking. Played to a knowledgeable crowd (I was sat next to a violinist from the Philharmonia) Lakatos were received with great acclaim. Their new disc on DG, Later with Lakatos [DG 459 642-2-11] recorded live in Budapest, is every bit as exciting. Buy the disc, or better still see them. Highly recommended. Lakatos are playing at Ronnie Scott's (47 Frith Street, Soho, W1) every night this week until Saturday 17 June.